The Vantage Point Server utilizes a web-based interface for management. 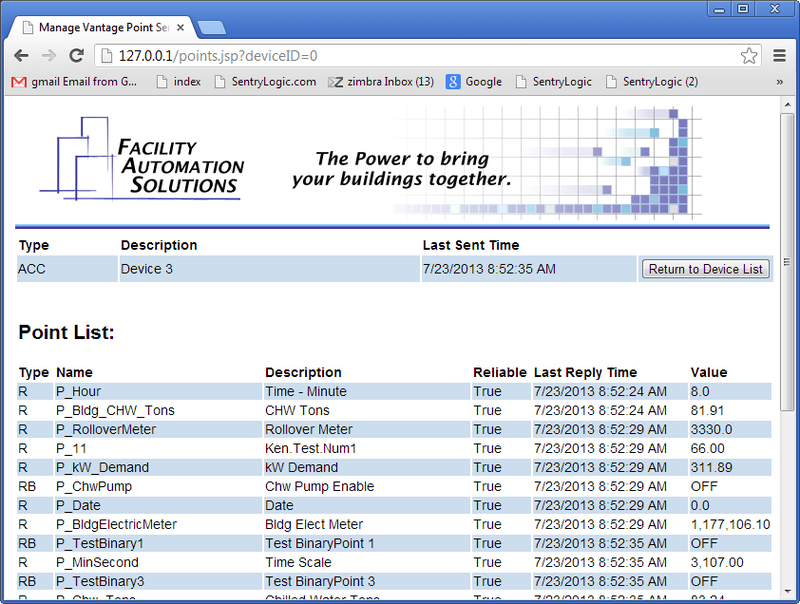 View a list of connected devices, the data points received from those devices, and the last received values from those points. To access the interface from the machine running the Vantage Point Server, simply enter "localhost" or "127.0.0.1" into the address bar of a web browser, such as Internet Explorer or Firefox. Enter your login credentials to proceed to the main page of the interface. To access the interface from a different machine on the same local network as the Vantage Point Server, enter into the address bar of a web browser the host name or IP address of the machine on which the Display Server is installed. 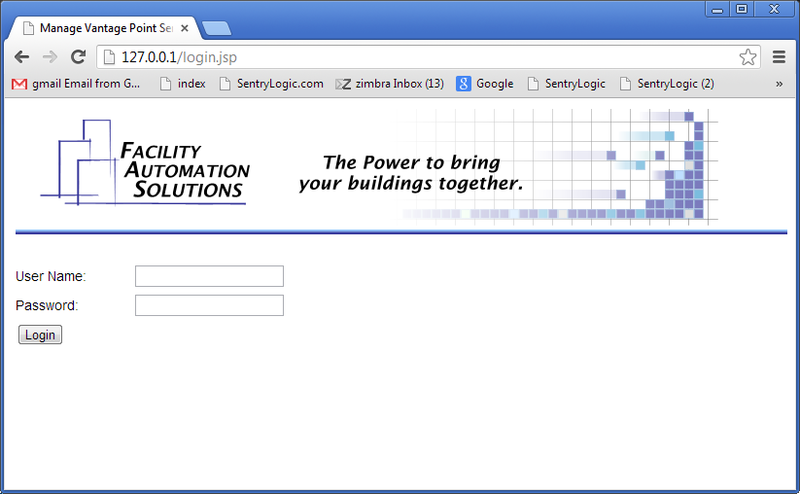 Then enter your login credentials to proceed to the main page of the interface. Remote access to the Vantage Point Server is possible but must first be setup with coordination from your Network Administrator. Specific instructions will vary depending on how your Network Administrator creates the connection, if your company allows such remote access. Please contact us by phone to arrange to receive instructions for creating login credentials. To restart the server, click on the Restart Server button. To view and edit the configuration file, click on the Get Config File button. This will take you to the Configuration File page. You can view it and make any changes necessary to it directly from the page. Once you are done, click on the Return to Device List button to return to the main page without saving any changes made to the configuration file. Once you are done modifying the configuration file, click on the Update Config File button. The configuration file will be updated with the changes you made and then you will be returned to the main page. 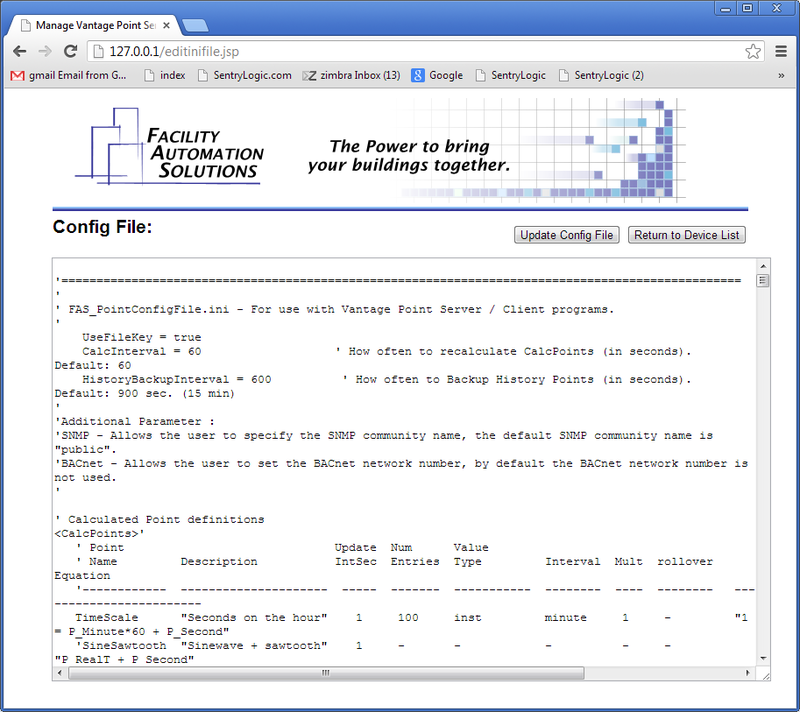 The main page displays a list of all devices connected to the Vantage Point Server. Next to each device in the list is a Select button. Clicking on one of these buttons will load a new page that displays a list of all the data points from that device along with the last value received for each point. To return to the main page, click on the Return to Device List button.